"Ikari, you have to realize that there can be no turning back." The above info came from Elwin Blaine Coldiron, and was edited by yours truly (contact me). The image came from 2730. 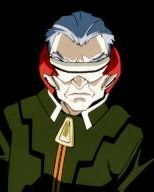 Keel Lorenz is the head of the secret organization SEELE (German for 'soul'). Through their own interpretations of the Dead Sea Scrolls, they had determined that 18 angels will herald mankind's eventual end. To circumvent this, they had founded the Gehiern Project (the predicator to NERV (German for nerve), as well as the Human Instrumentality Project. 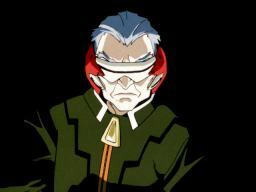 Working with Gendo Ikari, and using genetic samples of the first angel Adam, Lorenz and SEELE had created the Evangelions to safeguard humanity until the project is completed. Lorenz's relationship with Gendo is one of a great friend, and together, through cover-ups and other underhanded means, they had kept the truth of Second Impact hidden from the rest of the world, which includes the origins of the Evangelions. However, Lorenz, along with the rest of SEELE, is beginning to suspect Gendo's true motives... the resurrection of his wife Yui... and as a result may have to use unconventional methods to accomplish the goals of the Human Instrumentality Project.